There is a holographic element in Jewish history, a self-similarity between People and people. It would not be too much of a stretch to view the Torah as the blueprint for the longest-running social experiment in human history. Nowhere is this so evident as in our current age, where we can look back and see historic patterns that were invisible to those living through them. For example: Parashat Ki Tavo and Parashat Nitzavim. Neither of these two parshiot stands alone; each must be understood through the other. They are two halves of a story. Our generation would appear to be living on the cusp, the transition point between Ki Tavo and Nitzavim, read one week apart. These two parshiot—Ki Tavo and Nitzavim—are about history, about what we will go through and where it will bring us. The fact that Parashat Ki Tavo starts the way it does is indicative. We are told to recount our history—the bad times and the good times—upon bringing the first fruits to Bet HaMikdash. In doing so, we remember that our past has borne the fruit of the present. It is a lesson in learning from history. The parshiot prior to this have set the scene for what follows. We are called upon to do certain things, abstain from doing others. We are called upon to “circumcise our hearts” in following all these instructions. Circumcision is “Brit Mila”, the sign of entering into the Covenant. Does this enigmatic phrase mean bringing the heart into the covenant? Entering into it with all our hearts? Perhaps. But the later part of Parashat Ki Tavo makes very clear, in explicit detail, what will happen when we don’t—or can’t—do all of this. What is chilling is that there is only a hint of “if”; the unfolding of the curses is presented as all but inevitable. Of course, this may be because it was written for those who were themselves living through such a time. But it’s no surprise that many modern parshanim see these verses as a prophetic glimpse of the Shoah. The inevitability of it all is laid out very plainly in next week’s parasha: “When all this has come upon you, the blessing and the curse…” So it was known from the outset that we would be subject to the curse as well—that we would not be able to “circumcise our hearts”. Why then were we presented with a test that we could not pass? But differently: Why were the past two thousand years necessary? Perhaps because the real lesson was the curse, not the blessing? Perhaps because the real test was somewhere in all these generations of exile and transformation? Perhaps we cannot know the answer. Perhaps the question is too big for any single answer. 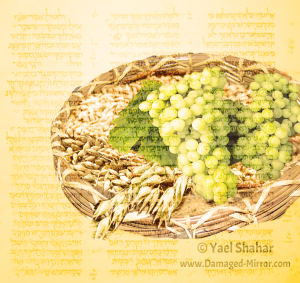 We say, “Hu ya’aseh shalom…” at the end of the Kaddish. Why? Perhaps because we know that we can’t reach true peace on our own. All the praise and joy of reality expressed by the words of the Kaddish, but we can’t reach it on our own. Once that peace is shattered. We are alone with the silence. We struggle against the darkness, but our own efforts do not suffice. Parashat Nitzavim offers the intriguing insight that the history and struggles of any one of us bears some relation to what we have endured as a people. We are like holograms—the whole is present in each part. All of our history is present in the soul of each of us. Any single Jewish soul contains not only our history, but the Torah which we have made a part of us. But what is even more intriguing is the hint at a deeper meaning in history. We read, “u’mal Hashem Elo-khecha et levavcha”. Hashem will circumcise your hearts so that you may love Him. What we could not accomplish on our own, will somehow be accomplished for us. We could not mold ourselves into the people we were supposed to be, just by an act of will. Instead, we were molded by our history. Parashat Nitzavim tells us that after we have been shown that our own efforts will not be enough, then, and only then, will we be given help. After we have been brought to face our helplessness and the inevitability of our history, after we’ve come to see that our own resources are not enough—only then will we be shown that they do not have to be enough. We are not alone. We are not abandoned. What we could not do by our own efforts will be given us: “to love Hashem Elo-khecha with all your heart and all your soul so that you will live.” (לאהבה את-ה’ אלו-היך, בכל-לבבך ובכל-נפשך–למען חייך.). Having just come out of the dark years, we are a bit afraid of the light of redemption dawning all around us. We need time to adjust, to convince ourselves that the nightmare is over, that we are waking up. We can look back at what was foretold then as finished now, or mostly finished. The worst of it is over (אי”ה). Looked at from this vantage point, where we can see it as a whole, there is a kind of symmetry in it all. We can rejoice in the fact that we have in fact been changed by what we have gone through. There are mistakes we will never make again. There are others that we at least know the consequences of, so that we will stop before going over the brink. Seen in totality, there is a wholeness to all of this. The historical message is: we had to go through that in order to reach this point. It was necessary. No suffering is as hard to bear as unnecessary suffering. But this was necessary. Am Yisrael is a hologram, with each individual carrying inside an image of the whole. The message for the individual is the same: my past has given me what I could not have reached on my own. We are the first fruits of our own defeats. The Torah of History: A victory inherent in defeat?